Geneva – IOM, the UN Migration Agency, reports that 32,080 migrants and refugees entered Europe by sea through the first 150 days of 2018, with about 42 per cent arriving in Italy and 34 per cent in Greece, with the remainder (24%) arriving in Spain. This compares with 70,870 arrivals across the region through the same period last year and about 230,230 at this time in 2016. IOM Rome’s Flavio Di Giacomo noted that the 13,430 migrants who are registered as having arrived by sea to Italy this year is an amount over 78 per cent less than that reported last year in the same period, when 60,228 irregular migrants and refugees arrived in Italy and an 80 per cent decline from the 70,222 arriving to this point in 2016. 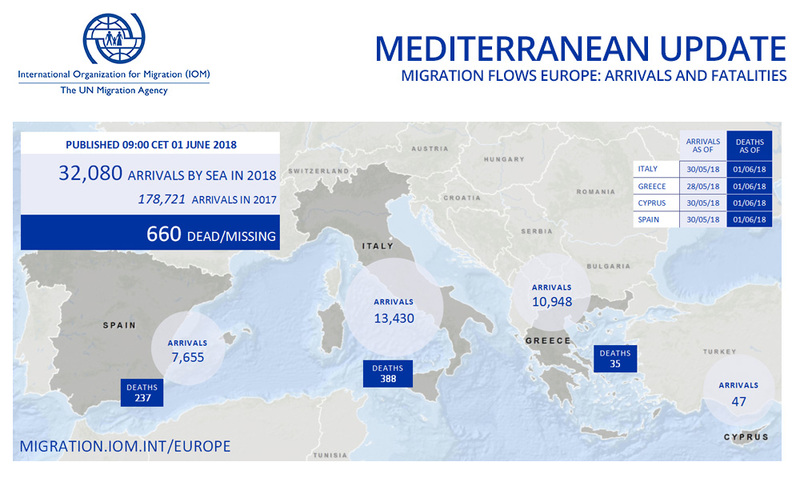 Arrivals to Italy through the first thirty days of May are just over one-sixth of last year’s May volume, and one-fifth of that of May 2016 (see chart below). In Spanish waters so far this year, IOM Madrid’s Ana Dodevska reported Monday that a total of 3,028 migrants have been rescued on the Western Mediterranean route through 30 days in May – compared with 835 for the entire month of May last year. That brings to 7,655 the total number of men, women and children who have been rescued trying to enter Spain by sea this year (see charts below). In the Mediterranean alone, 660 people have lost their lives at sea since the beginning of 2018. Most recently, at least three people went missing in the Central Mediterranean on 25 May. Survivors interviewed by IOM staff in the Port of Messina, where they arrived on 28 May, reported the disappearance of at least three other passengers who jumped into the water during a rescue operation off the coast of Libya in which the Libyan Coast Guard was involved. In the Western Mediterranean, the Spanish maritime safety agency recovered one body and rescued three survivors from a sinking boat 24 nautical miles south-west of Tarifa, Spain on 29 May. Survivors reported that one person went missing before the rescue took place. At least four times as many migrants have died in the Western Mediterranean in 2018 compared to the same period last year. IOM Greece’s Kelly Namia reported Monday that over five days (23-28 May) the Hellenic Coast Guard shared details of at least five incidents requiring search and rescue operations off the island of Lesvos, Kos and Samos. The Coast Guard rescued 152 migrants and transferred them to those respective islands. Namia reported that besides those 152 who were rescued, another 155 migrants arrived during the four days, landing in Samos and Kos and bringing to 10,948 the total number of irregular migrants entering Greece via sea since January 1 – for an average of around 74 persons per day. IOM’s Ivona Zakoska in Vienna reports this week that migration flows through the Western Balkans are still on the rise. By the end of May, authorities in Bosnia and Herzegovina, Montenegro and Albania registered more than 6,700 new irregular migrants, more than a two-fold increase compared to an estimated 2,600 migrants and asylum seekers registered in these countries in the whole of 2017. More than two thirds of all migrants and asylum seekers were registered in Bosnia and Herzegovina – a total of 4,227. An estimated 22 per cent of those are individuals declaring Syrian origin and the same percentage was recorded for those declaring Pakistani nationality. Some 12 per cent of migrants declared arriving from Afghanistan, 10 per cent from Iran, 8 per cent from Libya and 7 per cent from Iraq. Authorities in Montenegro reported apprehension of 1,362 migrants and asylum seekers, mainly Syrian nationals (47%) followed by those from Algeria (12%), Pakistan (12%), Morocco (7%) and Iraq (7%). The remaining individuals were registered as nationals of 17 different countries. In the first three weeks of May, authorities in Albania registered 1,180 migrants and asylum seekers, predominantly from the Syrian Arab Republic (57%). Other registered nationality groups were Iraq (8%), Pakistan (7%), Algeria (6%), Morocco (5%), Libya (4%), Palestinian Territories (4%) and Afghanistan (3%). According to the field reports, migrants and asylum seekers who are undertaking this route (mainly from Greece towards Albania, Montenegro and Bosnia and Herzegovina) aim to reach Western Europe. Worldwide, IOM’s Missing Migrants Project has recorded 1,186 people who died or went missing while migrating in 2018. Additionally, the IOM office in Niger reported that two bodies were retrieved during a search and rescue mission conducted in northern Niger on 26 May. IOM staff found 80 migrants in the desert north of Agadez who had been stranded for three days after being abandoned by smugglers. Tragically, two died of dehydration. Latest Mediterranean Update infographic here.